Hail and well met! We are the Figures in the Fog and today we’ll be reviewing the new cards for Ashes: Rise of the Phoenixborn, added in The King of Titans . This is the second entry in this series, so if you haven’t read our first article, you can catch up here: http://www.strangecopy.com/index.php/2018/09/15/figures-in-the-fog-review-xander-heartsblood/. Now that everyone is back, Xander has several friends he’d like us to introduce, including: 1 Ready Spell, 1 Action Spell, 1 Ally, 1 Alteration, and 3 Conjurations. Xander’s first Ready Spell is called Summon Cerasaurus Mount and introduces the new Mount mechanic. The Summon Cerasuarus Mount costs a Main Action and basic dice to play and then costs a Side Action, a Natural class die and a Divine class die to activate. But, there’s an additional requirement; in order to summon a Cerasaurus Mount you must have an unexhausted Ally on your side of the Battlefield. Then that Ally is placed face-down underneath the new Cerasaurus Unit. Before going over the Cerasaurus Mount itself, it’s important to understand the new Mount mechanic. When an unexhausted Ally is Mounted, and is flipped face-down, all other tokens are removed from that Ally, including status tokens and wounds. This means that as long as an Ally is unexhausted, that Ally can be fully healed by being Mounted. Additionally, any Alterations that are attached to the Ally are discarded when that Ally is Mounted. When those Alterations are discarded, if they have the Respark ability, it can be triggered, and those Alterations can be returned to their owner’s hand(s). Now, back to the Conjuration, the Cerasaurus is a 3 Attack, 3 Life, 0 Recover and 3 different abilities. The first ability is called Overkill 1. This ability is exhaustible and is the same as Elephant Rider and the ability provided by Power Through. The second ability is inexhaustible and called Unsummon. Unsummon uses a Main Action and allows the owner to discard this Unit. While this seems bad at first glance, the Cerasaurus’s final ability, Dismount Rider, will help to take advantage of this ability. Dismount Rider in an inexhaustible ability that says that when this Unit leaves play, the Ally beneath it gets placed back on the Battlefield. Pairing Dismount Rider with Unsummon, gives the controlling player the ability to actively control when the Ally returns to the battlefield, instead of relying on their opponent to destroy it. When an Ally is Dismounted, that Ally returns to the owner’s Battlefield with an exhaustion token placed on it. 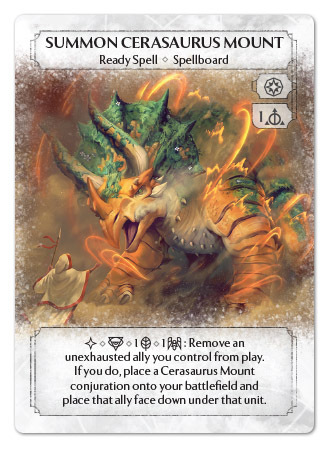 After the Ally returns, the controlling player may place 1 wound on that Ally and remove an exhaustion token. The fact that the Ally returns to the Battlefield with an exhaustion token on it means that effects that trigger when the Unit enters play, like Ambush, cannot be triggered. And for those Astrea players out there, if you Mount an Ally that was stolen with Mark of the Goddess, you get the Mount Conjuration. But, when the Conjuration leaves play, because the Ally returns to the owner’s Battlefield, your opponent will get their Ally back and can choose to unexhaust it. All around, Cerasuarus Mount is one tough customer. With 3 Attack it trades with the vast majority of Units in the game, giving plenty of opportunities to get value out of its Overkill ability. And at 3 Life, it is outside of most efficient removal effects. And even if it is destroyed, there is still the matter of the Rider to deal with. Requiring both Divine and Natural symbols, Cerasaurus is only 1 dice type away from both Hammer Knight and Sonic Swordsman. Additionally, due to activating Summon Cerasaurus only costing a side action, it’s possible to spend a Main Action playing an Ally, like Fire Archer or Hammer Knight, and then Mount them on the Cerasuarus. Forcing your opponent to deal with an effective 3 additional Life, before being able to deal with the Hammer Knight. X: If this card is any indication, Mounts are going to be really strong. There are a couple of ways that your opponent can limit getting it online. But I think that Mounts have a good opportunity to help swing decks, both by protecting a powerful Ally, and by providing an additional swing. The other benefit is that provides an easier way of getting multiple uses out of a powerful Ally. I also like that this is the first summon Ready Spell that doesn’t have a book. This could be due to the different set of artists, but my personal theory is that Xander is illiterate, so it wouldn’t make any sense for him to use summon books. N: This card is crazy. 2 dice for a 3 attack unit is good no matter how you cut it, and the Overkill is just icing on the cake. Cerasaurus (and to a certain extent, mounts in general) is fantastic in Brennen, who can just Spirit Burn it after swinging. I’d also like to point out that Cerasaurus wins in a direct exchange with Frostback, its biggest competitor. The first Ally Xander is introducing goes by the name Raptor Herder. Raptor Herder costs a Main Action and either a Natural class OR a SYMPATHY class die to play. Like other 1 class die Allies: Fire Archer and Shepherd of Lost Souls, Raptor Hereder has 1 Attack, 1 Life, 1 Recover, and 1 ability. However, Raptor Herder is probably a best compared to another Ceremonial card, Summon Sleeping Widows. Because, Raptor Herder never hunts alone! Its ability, Call Raptor Hatchling, triggers when it comes into play also summons a Raptor Hatchling Conjuration. Raptor Hatchling is 0 Attack, 1 Life, 0 Recover, and 1 ability. 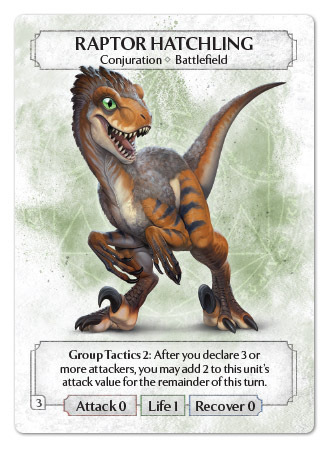 Raptor Hatchling’s ability, Group Tactics 2, triggers when the controlling player declares 3 or more Units as Attackers, either against a Phoenixborn or a Unit, and adds 2 Attack value to this Unit. This ability is a slightly stronger version of the Beast Warrior’s Group Tactics 1 ability. So with the addition of the Raptor Hatchling, it is easy to see why Raptor Herder can be compared to Summon Sleeping Widows. To recap, for a Main Action and 1 Natural class or 1 Sympathy class die, the player gets a 1/1/1 Ally and a 0/1/0 Conjuration, that when combined with 1 additional Unit threaten 3 potential damage. Additionally, the low Attack value on the Raptor Herder makes it an easy Ceremonial dice power target, giving the User a reliable 2 Unit summon for only 2 dice. The largest drawbacks of this Unit are that both halfs, the Herder and the Hatchling, are very fragile and can easily be dispatched. Additionally, the Hatchling poses no threat if there are 2 or less unexhausted Units on its side of the Battlefield. 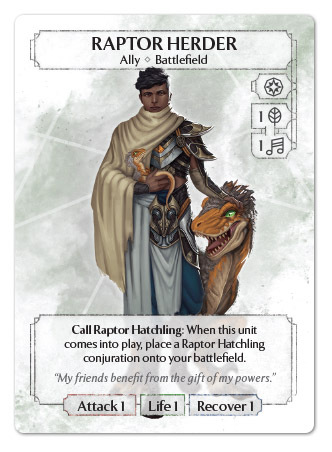 The last potential downside of this Unit is that Call Raptor Hatchling is an exhaustible ability, meaning, not only is it susceptible to Choke, but Mounting/Dismounting a Raptor Herder will not provide additional Raptor Hatchlings. X: Looks like cheap swing decks, like the base Aradel or some Lulu decks, just got a new friend. The alternative cost of Raptor Herder, costing Natural class or Sympathy class, is great for increasing the number of decks it can be included in. A very cool combo for this card, is pairing it with the Summon Spectral Assassin. For a total of 2 either Natural or Sympathy class dice, 1 illusion class die, 1 basic die (4 total), 2 Main Actions, 1 Side Action, and 2 cards from hand, you can get 4 Units on the Battlefield, that can threaten to swing in for 6 damage. N: I really like this card. Works not only in swing decks but also decks that just require a lot of bodies on the field (I like playing Brennen, okay). The parallel cost makes perfect sense for this card and I love that it gives just a little extra deckbuilding opportunities. The last set of cards to talk about today starts with an Action Spell called Summon Shining Hydra. 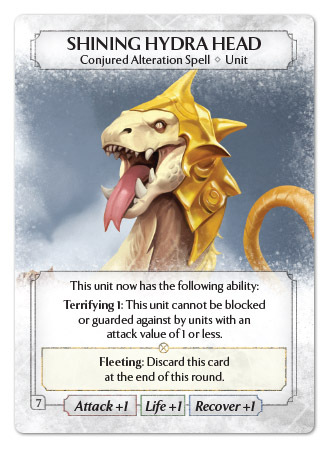 In exchange for a Main Action, a Divine class die, a Natural class die, and a basic die, the active player receives a Shining Hydra Conjuration. The Shining Hydra is a 3 Attack 3 Life and 0 Recovery Unit with 1 ability, called Regenerate Heads. 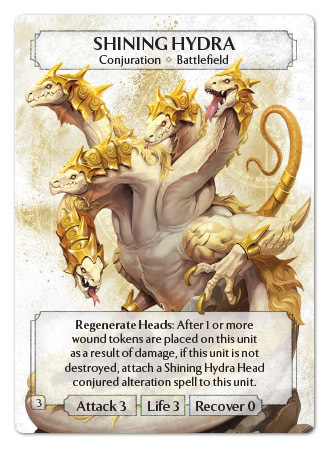 Regenerate Heads triggers after 1 or more wounds are placed on the Shining Hydra as a result of damage, if the Hydra is not destroyed, it gets a Shining Hydra Head attached to it. Shining Hydra Head is a Conjured Alteration with the Fleeting ability, that adds 1 Attack, 1 Life, and 1 Recover to the attached Unit. Additionally it also gives the attached Unit the Terrifying 1 ability. Terrifying is an ability introduced by the Beast Mage, that says that the Unit cannot be blocked by Units with X or less Attack, where X is the number associated with the Terrifying ability. Putting it all together: for a Main Action, 1 Divine class, 1 Natural class, and a basic, the controlling player gets a Shining Hydra With the Regenerate Heads ability, every time the Shining Hydra survives damage, it gets a Shining Hydra Head attached to it, that provides the Unit, +1 Attack, +1 Life, +1 Recovery, and the Terrifying 1 ability, until the end of the round. 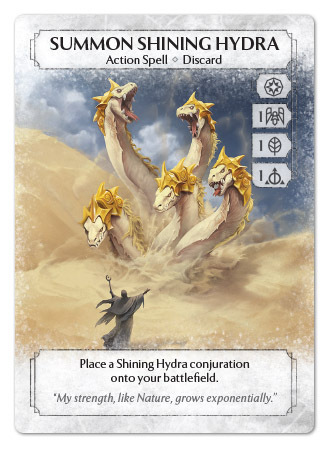 There are a total of 7 Shining Hydra Heads that could be attached, meaning that a player could have a 10/3/7 with Terrifying 7 without ever healing it. Note that since each head provides the Terrifying 1 ability, since the abilities have a number associated with it, they stack. So a Hydra with 2 heads, has the Terrifying 2 ability, and can’t be blocked or guarded against by a Unit with 2 or less Attack. X: So on the one hand, this card looks awesome, and I really like the theme. On the other hand, it’s going to be super difficult to get online. Poison, Small Sacrifice, and maybe Drain Vitality seem like biggest enablers of this card, but are all in Ceremonial, which immediately locks you in 3 magic types. And even if you do manage to get it online, a single Regress ruins the whole combo, removing all of the Shining Hydra Heads you’ve manage to attach, and reducing the Attack of the Unit to below zero! The last card interaction I want to talk about is the intriguing synergy with Polarity Mage. If you can come up with a way of getting multiple Shining Hydra Heads out, hiding them beneath Polarity Mage, and then you can give them to other Units. I don’t see this being particularly practical, but it’s a very cool combo that looks super fun. N: But why do the heads disappear? I don’t get it. I love the theming of this card, and the art, but I think it’s a tad too finicky to see competitive play. My first instinct would be to run in in something with String Mage and Small Sacrifice, but then you’re already in four colours. It might be possible in Orrick, and it would put you in HK and Sonic colours… There are possibilities, just hope you don’t meet up with Regress. Whew! For only introducing 3 new cards, Xander sure is bringing a lot! 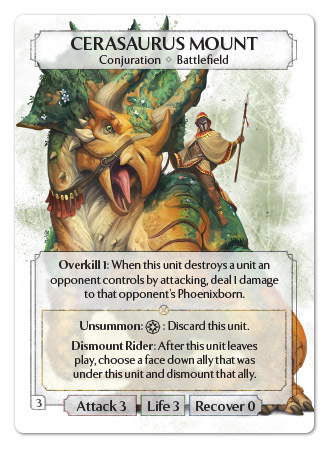 PHG should have another article posted on Tuesday next week, introducing 3 new cards from King of Titans. So until then, tell us what you think of ALL the new cards we introduced this week in the comments below. Join us later this week when we discuss the newest cards from The Ghost Guardian. Alas, our time in this place has come to an end and we must Fade Away, but the Figures in the Fog will return soon! You have been warned.